In the first century of the post-Reformation Norbertine mission in England, our confrères ran several parishes across the country. One of those parishes was Spalding in Lincolnshire, which became home to a shrine to Our Lady of Lourdes thanks to the enthusiastic efforts of a devoted son of St Norbert, Father Clement Tyck. 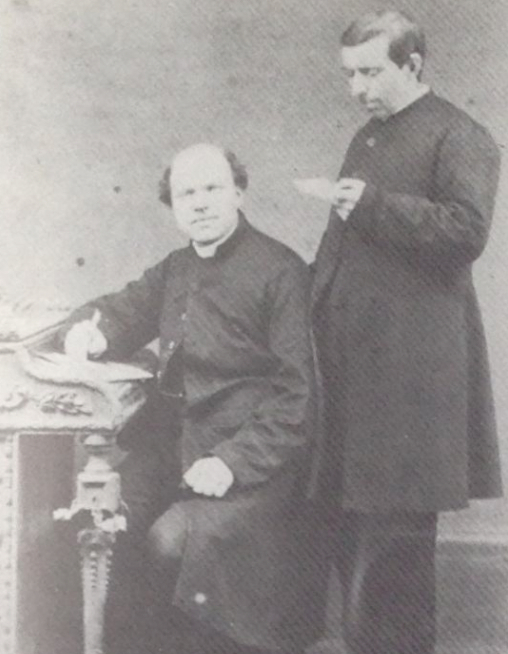 Father Martin Guedens (seated), who opened the Spalding mission, and Father Thomas Aquinas van Biesen, its first parish priest. On the feast of the Immaculate Conception 1875, Father Guedens and Father Dockx from the Abbey of Tongerloo in Belgium, who were working in the English mission, travelled to Spalding and celebrated a solemn Mass in a room of a ramshackle set of buildings that the mission had recently acquired to transform into a new Church. 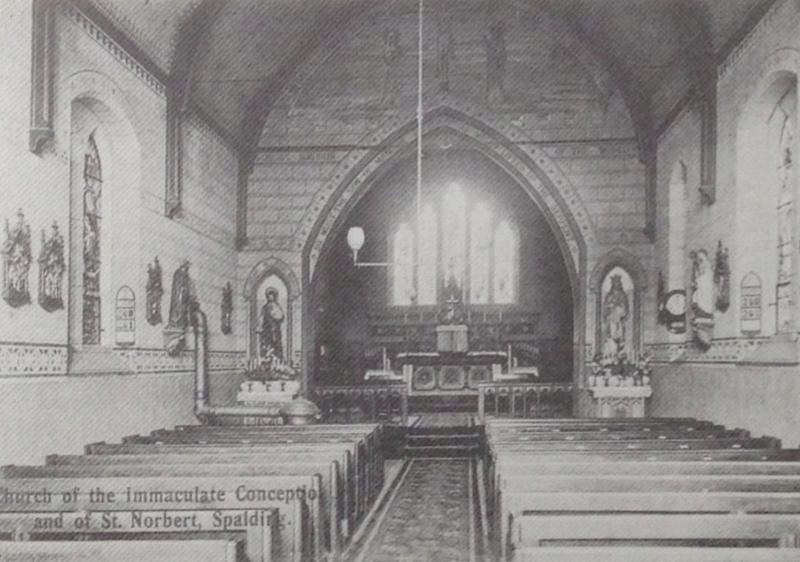 An architect from Sheffield was commissioned to build the new Church, to be dedicated to the Immaculate Conception and St Norbert; the church was opened in 1877. Thomas Aquinas van Biesen was appointed parish priest, where he remained until his retirement in 1903. He was replaced by Father Clement Tyck, who had struggled living in industrial Manchester. Immediately, Father Tyck poured himself into the parish. As well as his normal parish duties, he wanted to encourage traditional devotions, particularly to Our Blessed Lady (unlike industrial Manchester, the Fenland Spalding was in an area of the country well-known for its anti-Catholic sentiment), promoting local Catholic associations and children’s groups, and he set about making arrangements for the consecration of the Church. Even the local paper had become enthusiastic, for Spalding had not seen such spectacle before: “there ceremony will be a most imposing one. The white marble altar table, the possession of which is necessary before the ceremony can be performed, has been placed in position, and it is an additional ornament to the interior of one of the prettiest Catholic Churches in the country.” The Bishop of Namen (Namur), who was formerly the Abbot of Tongerloo, Thomas Heylen had travelled to Spalding to consecrate the Church in September 1904, assisted by Father Guedens, who was now himself the Abbot in the English mission. The consecration of the Church in 1904. 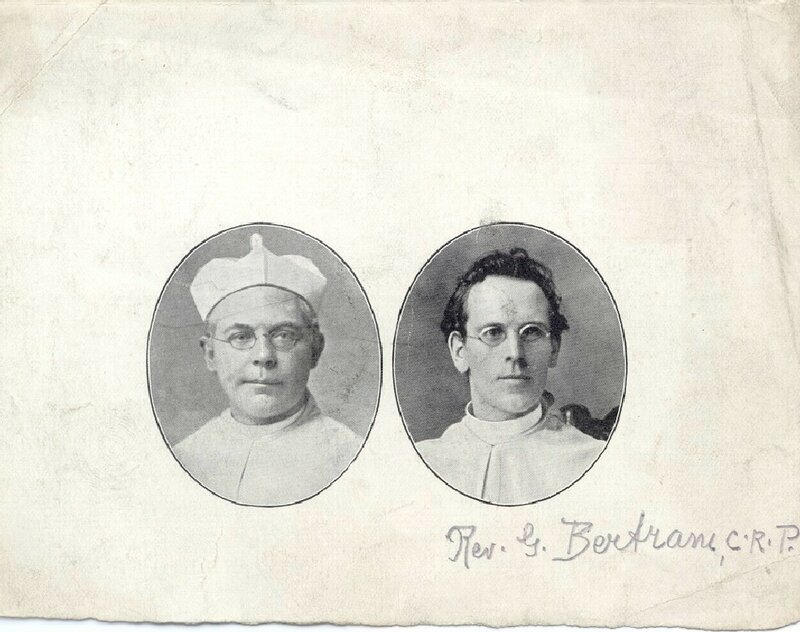 Father Clement Tyck (left) pictured with Father Gabriel Bertram (with autograph), who served as curate in the 1890s. A grand procession took place every year in honour of Our Lady, even throughout the war, during which the Catholic Church in Spalding spearheaded the opening of a refugee centre; the town was awash with Belgian refugees throughout the war. But with the departure of Father Tyck in 1921 (who was by now blind), and as the leading figures of the foundation of the parish had started to trickle away from their earthly pilgrimage, the popularity of the procession waned. The last one was held in 1922, and Father Tyck’s “Little Boy’s Band” which had annually provided the music for the festival was ignominiously disbanded. Fortunately, in 1940, a new parish priest, Father Norbert Ellis arrived in Spalding with a mind to reinvigorate the community. With the help of Polish servicemen who were living in the area, he restored the Church and shrine to its former glory. A grand procession was once again held in honour of Our Lady in 1976. After Father Tyck retired to Tongerloo, he once again visited Spalding on his way to Manchester in 1934. He died on the 9 February 1950.